Cicero Verus is an Imperial commoner who lives with his two brothers at Three Brothers Trade Goods in the Market District of the Imperial City. Unlike his brothers Sergius and Tertullian, Cicero does not sell anything. Instead, he makes a living handing out copies of The Black Horse Courier. Being a vendor of the Imperial City's only newspaper is hard work, and Cicero tries his best dividing his time between work and his brothers. They all sleep in the private quarters above the main trading room every night between midnight at 6am. After waking up, they always eat a two-hour breakfast together in the shop, before going their separate ways. On Morndas, at 8am, Cicero heads to the Temple of the One for four hours of praying before work. After praying, and on all other days starting at 8am, he wanders around the northeastern block of the Market District and offers the Black Horse Courier to everyone who passes by. He always returns to the shop at 6pm to keep his two brothers company until closing time. At 8pm on regular weekdays (Morndas to Fredas), he heads to The Feed Bag and enjoys his dinner until his bedtime at midnight. On Loredas, Cicero skips dinner and stays inside the shop all evening. And on Sundas, after eating the mediocre food at The Feed Bag all week, he treats himself to a dinner at the exclusive Tiber Septim Hotel until midnight. 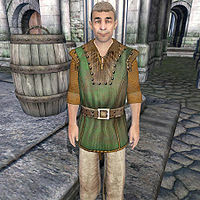 Cicero was also intended to play a role in the unfinished "Imperial Couriers" quest; at midday on the 13th of each month, as long as Olav is still alive, he will head to the Black Horse Courier office in the Market District and spend a brief amount of time there, before resuming his usual routine. On the 20th of each month, when the clock strikes midnight, he leaves the Imperial City and begins his long journey towards Cheydinhal. He crosses the Talos Bridge and heads north on the Red Ring Road, all the way around Lake Rumare, until he turns northeast on the Blue Road. The trip takes him around 16 hours and he usually arrives at Cheydinhal's western gate between 4pm and 5pm. Once there, he heads directly for Newlands Lodge, and spends the next two days having fun with the regulars there. At midnight on the 22nd, he leaves Newlands Lodge and heads back to the Imperial City, his brothers and his duties for the Black Horse Courier. He wears the rare zero-weight forester's shirt, a pair of light brown linens and russet felt shoes. He carries around the shop key and a considerable amount of gold. As the three brothers look very much alike, he will always make sure you know who you are talking to: "Tertullian, Sergius, and Cicero... the Three Verus Brothers. I'm Cicero." And he absolutely despises the Thieves Guild: "It would be perfect... if the Watch could just get rid of the damn Thieves Guild. You don't have this problem in Anvil or Bruma." Confusion about which brother is which reigns throughout the city. Some folk will say that "I shopped at Three Brothers a couple of days ago. Not sure which one I talked to, though." and others opine "Three Brothers have some good merchandise. Don't know if I've met all three brothers, though." The three of them have definitely made a good impression on the people of the Imperial City though. Townsfolk will often be overheard saying "Cicero, Sergius, and Tertullian run a good shop." and "Don't the Verus brothers run a good shop?" Others are less committal and just ask "Have you ever browsed the goods at Three Brothers Trade Goods?"